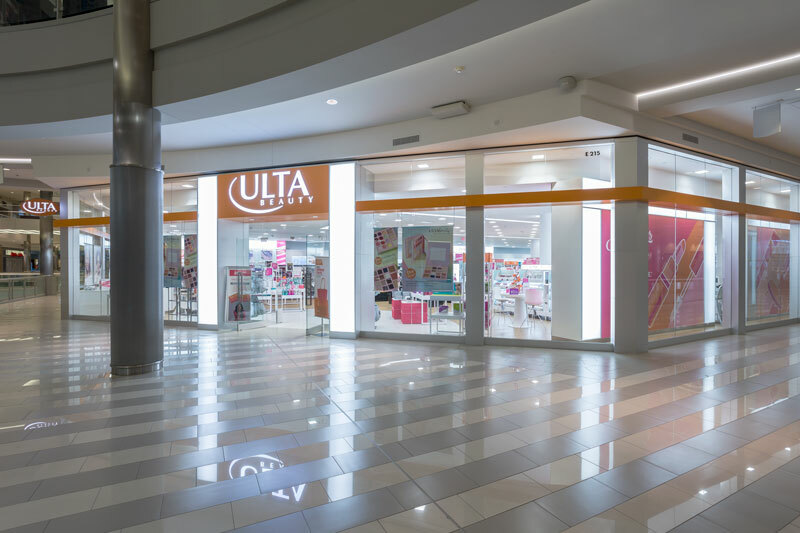 Elder-Jones recently completed the construction of a 11,075 square-foot ULTA Beauty store located on the second level of the Mall of America in Bloomington, Minnesota. The project started in May of 2017 and had an 18 week construction schedule to completion. It was an exciting and successful project for both us and ULTA. There were a few aspects of this project that made it challenging. The project included approximately 170 linear feet of new storefront that involved the installation of new structural steel, glass, and brake metal. The store is located in a corner space near one of the main mall entrances making the installation and appearance of the storefront an essential part of the project. The proximity of the store to the loading dock area also provided some challenges. There was a substantial amount of planning and coordinating needed for deliveries to the space as all items were required to be brought through one of the main mall walkways. Another challenge we faced was completing all of the underslab plumbing and electrical work for the store, with it being located over multiple other tenant spaces. We worked very closely with the tenants below the ULTA space to coordinate access and security completing all of the underslab work. The Elder-Jones team that worked together on this project were instrumental in making it a success. Tom Jerstad and Marvin Bontrager were hands-on with all aspects of the project from the initial planning and scheduling phases all the way through punchlist completion and store opening. © 2018 Elder-Jones. All Rights Reserved.